Clueless when it comes to looking for directions when you're driving? Wanna hunt down the newest, hottest eateries in town but dunno how to get there? 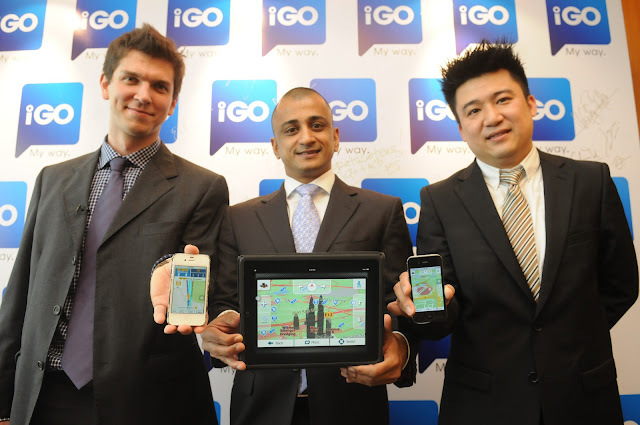 Never fear, iGO primo app SEA edition is no here! Available at a promotional price of USD$9.99 for a limited time only, the navigation app is popular among iPhone and iPad users for its reliable route planning, intuitive interface and impressive 3D visualization. Download of community maps is FREE and users can also extend their navigation experience by purchasing speed camera databases and other services. The community mapping portal and forum is open to public, ensuring its extensive maps are continuously updated and self-verified by MFM and NavNET contributing members, providing reliable navigation to the app users. Other plus points include a wide range of advanced and mobile-optimized features such as Google local search, calling of POIs (Points of Interest) from within the app, Realistic Junction Views and 3D landmarks for easier orientation. “South East Asia attracts millions of travelers every year, although the local traffic can be a challenge for first-time visitors. By launching the iGO primo app Southeast Asia edition with community-based maps on-board, we are offering quick help in one hand for the most popular holiday destinations such as Singapore and Malaysia,” says Roger Huang, Vice President of Asia at NNG LLC. NNG’s wireless navigation solution for Southeast Asia is also available to network providers and smartphone manufacturers on Google Android and Microsoft WinCE operating system.